It’s been 3.5 weeks since I had shoulder surgery and I’ve been out one left arm, put up in a sling for a month to heal. I’m paying for a fun day at the beach body surfing that turned into a “Ooops, I just severely dislocated my left arm and need to go to the ER and get it put in 3 hours later after a LOT of drugs” kind of day. Dang it. Total bummer. 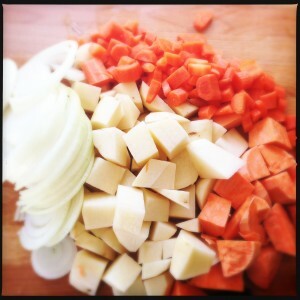 Ingredients for a slow-cooker curry! Surgery went well, but it turns out left arms are important for cooking. Well, so are right arms. Actually, it’s the whole having a left AND right arm that is kind of important for normal functioning. I’ve slowly been managing to figure out how to get things done, but the cooking eludes me. It’s been driving me nuts. I’ve realized how important cooking is for me, how much of an outlet it is. 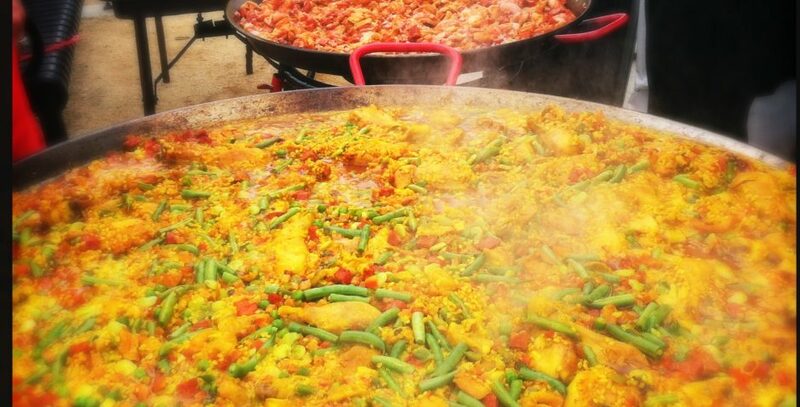 As someone said to me after I lamented how I wasn’t doing any cooking: “Cooking really is your ‘thing’ huh? '” Yes. Yes it is. Several weeks post surgery, the pre-prepared food was all used up. No goodies left in the freezer that I could take out and heat up, one-handed of course. 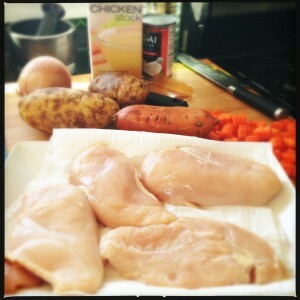 I was left with a decision: go shopping for more of it or use the chicken breasts I had in the freezer. I made the choice to go for it and use an easy slow cooker recipe. The most challenging thing about this recipe, for a one-handed chef, was peeling and chopping the potatoes. I went at it one handed, all karate style. Ok, maybe it wasn’t that crazy, but it felt like it. Toss into the crock pot…. Toss it all in the crock pot and 6-8 hours later – dinner is served! The smell in the house was great, but I must admit I wasn’t super thrilled with the taste. This recipe lacks a depth of flavor that one would expect in a curry. I debated about posting this if it wasn’t good, but it’s good to know the ups and the downs, right? 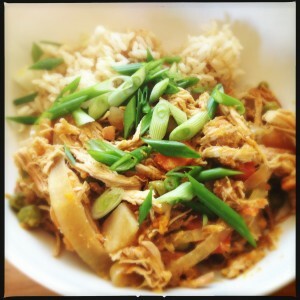 I used chiang mai curry powder in this recipe. First change I would make is to NOT use curry powder, any kind, and probably go for a red curry paste. I also might experiment with some tomato paste, and probably some fresh garlic and ginger as well. Let me know what you think might improve it. 8 hours later, peas added, served with brown rice and some garnish. Heat oil in a medium fry pan. Add chicken breasts and brown on both sides. 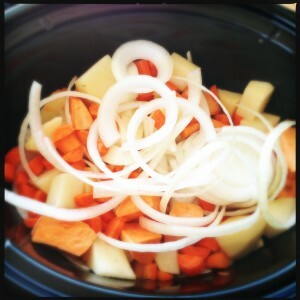 Place potatoes and onion in crock pot. Place chicken breasts on top. 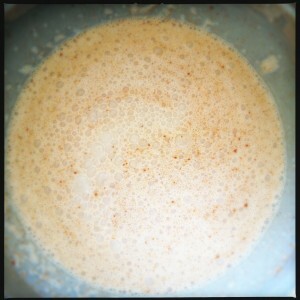 Combine coconut milk, salt, pepper, curry powder, hot sauce and chicken broth in a bowl and stir thoroughly. Cover and cook on low 6 to 8 hours. One half hour before serving, add peas on top of chicken mixture. Just before serving, stir mixture thoroughly and sprinkle with toasted coconut if using. Serve over rice or Asian noodles, if desired. This entry was posted in Quick Dinners. Bookmark the permalink.